The Ultimate Support JS-MNT101 - Universal Microphone Stand Holder For Tablet Computers is designed for live music performances, speaking presentations, and other applications that require a visual reference. The tablet holder can connect to nearly any microphone stand with its integrated c-clamp. It provides two points of adjustment for the axis and angle of the holder and will accommodate tablets that fit within the clamp depth of 0.25" (6.35mm) and clamping range of 5.25 to 10" (130 to 254mm). Box Dimensions (LxWxH) 7.9 x 7.8 x 4.1"
JS-MNT101 - Universal Microphone Stand Holder For Tablet Computers is rated 4.5 out of 5 by 25. Rated 3 out of 5 by Jeff from Decent value but not the most secure or versatile solution This holder will fit my 5th Generation 9.7 iPad either naked or in one of those thin cases with the folding screen protecting flap (but that's awkward). It does NOT fit with the 2-layer shell-style case I prefer. Not even after modifying the case to accommodate the non-adjustable holder clips. It seems reasonably secure in portrait mode but there may be some potential for the device to slip out. Alas, all these things make the holder not very useful for me - I went ahead and got a K&M holder which works much better for my needs. If you can use this holder with its limitations, the construction is decent and the price is certainly attractive. Rated 5 out of 5 by teluproductions from Something you should purchase two of... I am watching people walking around trying to either record or take pictures of, well this is a must for better quality everything. The other day while at an event I watched the master of ceremonies have a child hold up her iPad so that she could read it...well, again its like this purchase this device and be a star. However, allow me to point out this, plastic, and face sheets of plastic on your tablet, hair dryer on warm setting and open the hold-down devices would really help, and don't put it in a chair and sit on it!!! - I'm using it with my Teleprompter Pro App...what a blessing. Rated 5 out of 5 by J.T. from Good quality product It holds my old iPad perfectly, I use it attached to my tripod leg for remote camera operation. Rated 2 out of 5 by Barefoot Joe from not bad I bought this to hold an iPad mini and attach to a music stand. It does not fit very well as it is made for a full size pad. The clamps holding the pad are non adjustable left to right so it limits your ability to adjust the pad in it. It does clamp on to a music stand well so if you have a full size pad it will work for you. Also I tried my Nexus 7 pad and as it is slightly smaller it is an even worse fit. Rated 4 out of 5 by Samuel from Great product for a great price This product is great. Not sure about durability over time but overall is very well made and intuitive. It configures in many different ways also so you aren't limited in its configuration. The only thing I didn't like about it was it wouldn't hold my Android tablet, but it works perfect for my iPad. Great product for a great price. Rated 4 out of 5 by xratic from Mic Stand Tablet Holder As a performing musician, I use my tablet as a teleprompter for lyrics. This is very functional in that it provides a stable environment for the tablet. It would warrant 5 stars if the tablet with a protective cover would fit in the brackets that hold the tablet. Rated 5 out of 5 by Karriem from Great for tablets! Fits my 9.7 inch Ipad perfectly! I use it for playing music and reading names for introductions at events. great to use as a teleprompter on your tablet as well or to do video without looking for a stand of any kind. Foldable for easy storage too. I just bought one of these and can confirm it does NOT work with a 2013 Nexus 7. In landscape mode, it does not adjust small enough to grip the tablet. In portrait mode, the distance between the tabs on the top and bottom is too great for the width of the tablet. What is the maximum clearance for the table edge clamp? Will it hold a 12.9&quot; iPad pro? Will this fit a Nooh HD? 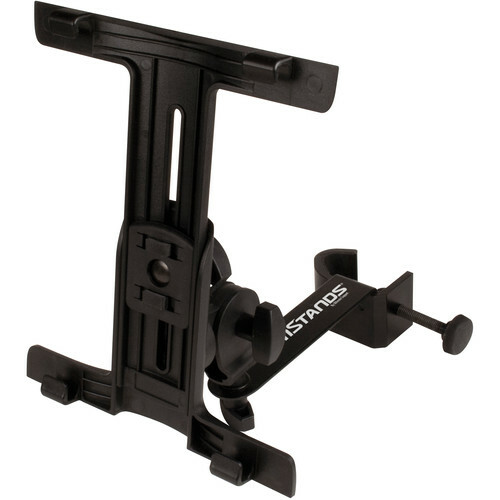 The Ultimate Support JS-MNT101 is a universal tablet holder compatible with the iPad Mini which is almost identical in size to the Nook HD tablet. No it does not rotate. In fact I had to make it expand a little more to accommodate my Samsung Galaxy Note 10.1, even though it was supposed to handle that tablet. Now I can set the tablet in the holder in Portrait and Landscape mode. Does anyone know if a regular sized iPad will fit with a case left on? Like an OtterBox for example? Do the feet that grab stick out far enough to accommodate? I would say: NO!There is already slight tension with the plastic clips with my 5th Gen iPad with no case.My dual-layer shell style case would not work at all. I even tried modifying it, cutting away the lip so the stand clips might fit over, but it wasn't even close.